Include a Cover Letter or introductory email specifically addressed to the person or company recruiting for the job. 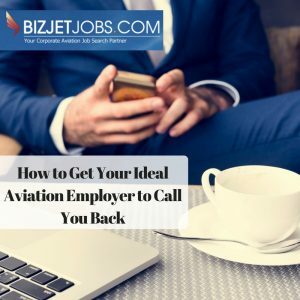 At BizJetJobs, we make it easy to apply for the job of your dreams. We also make it simple to customize a boilerplate email that you create for the specific job you are applying to. Check out our Cover Letter Template here. Talk about your work ethic, Emotional Intelligence, and how much you want the job. Any employer wants an employee who is hungry and humble, knows their strengths and understands how to help others leverage theirs. Increasingly, pilot recruiters are being told to look for candidates that have both the right fit skill-wise and the right attitude. This varies based on corporate culture, but in the aviation industry we are seeing more and more employers who believe that technical skills can always be taught — given the appropriate attitude and aptitude. So make sure you are honest about your hard and soft skills, that your resume is accurate, and that your log books are in good shape. The aviation hiring manager is encouraged to personally explore and verify every fact that will influence your success or failure. Damage the careers of both the hiring manager and the candidate, as well as other members of the organization. If you get to the interview phase, listen for agreement between what the interviewer says, the job requirements and what you’ve been hearing on the street. If everything matches up and you are a great fit in this corporate culture, be sure you let them know. Give them reasons why you would thrive in this type of environment. Employers want to hear from you why you are a good fit! If you feel you really understand and can embrace the culture, demonstrate that. Reiterate back to them your understanding of what they’re all about, how you fit in and why you are an excellent choice. Read more interviewing tips in our previous post, How to Interview Like a Captain. Are you a pilot employer with thoughts, questions, or comments about hiring a good corporate pilot? Are you a job seeking pilot wanting to know more about the corporate pilot hiring process? Do you have ideas about other topics we should cover? We want to hear from you! Please reach out to us directly. This entry was posted in Blog, How To, Pilot Advice, Pilot Jobs, Pilot Transitions, Salary by Amanda Jenkins. Bookmark the permalink.